Finding WordPress themes for writers isn’t as difficult as you might think. The content is the main focus, so you need to make sure the theme you pick is able to have full width blog posts. You should also make sure the overall style of the theme stands out as this allows you to tell your stories and share your thoughts in a more elegant way. We’ve gathered a collection of 11 WordPress themes for writers to make things a little easier for you if you’re on the lookout for a new content-driven theme. These themes are arranged by price, the cheapest theme appearing first. The Essence is a stunning, feature-rich theme. Designed by Meridian Themes, it contains everything you need to create an attractive writer’s website that will impress your eaders. 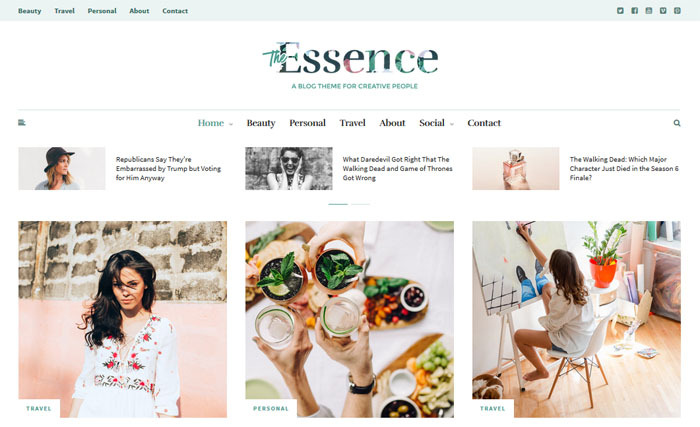 The Essence is a multipurpose theme, and it comes with multiple layouts out of the box that you can use as is or as a jumping off point for your own content. Writers will love The Essence’s layout options, including the single column option that puts your blog post content in the spotlight. You can choose to have a single column (recommended) or keep the traditional sidebar. The Essence is packed full of features, including custom sidebar widgets that might give you reason to keep one around. Boasting endless customization options, you have complete control over layout, colors, typography, spacing, and more. A few clicks of the mouse is all it takes to have a completely personalized and unique writer’s website. The Essence is an elegant and beautiful theme, perfect for creating a writer’s website that stands out from the crowd. My Blog is a powerful and flexible theme option from WPKube. Built for bloggers, it is easy to use and adapt to the perfect writer’s website. My Blog is a multi-purpose theme and comes with several layout options for you to choose from. If you decide not to have a sidebar, one option is to move important widgets into your footer. This keeps the extra functions, without distracting from your content. My Blog boasts tons of customization options and you have almost complete control over layout, colors, typography, spacing, and more. With a few clicks of the mouse, you can personalize your writer’s website to your heart’s content. My Blog is a robust and modern theme that will easily create a writer’s website that stands out. 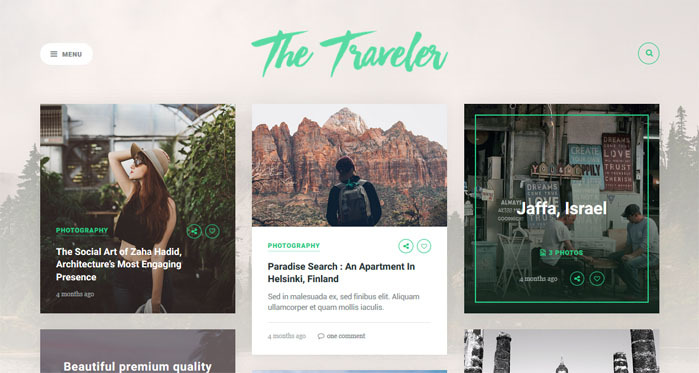 The Traveler is a light and contemporary theme that’s an excellent choice for a writer’s website. Designed by Meridian Themes, The Travelerheroes featured images in an elegant, grid-based display. The Traveler is almost endlessly customizable, with tons of layout, color, typography, spacing options, and more. You can choose to remove your sidebar and display your content in a single column if you wish. This is ideal for content-driven, writer’s websites so that the focus is on your words with no distractions. If you do choose to keep the sidebar, there are several custom widgets you can make use of including About Me, Instagram, and Social Media Profile widgets. These widgets are attractively designed and add extra functionality and interest to your site. The Traveler is a modern theme choice, perfect for creating a visually appealing writer’s website. Good is a minimalist theme by FancyThemes. The theme’s homepage features a variation of a split-screen design with a small area for the search bar and navigation menu fixed on the left side and your latest posts featured on the right side. One featured post displays with a very large image, title and excerpt at the top while the rest of your posts display underneath. The blog post page is where this theme wins its appeal for writers. The minimal left-hand sidebar puts all of the focus on your content, starting with a large featured image at the top to kick things off with a bang. You’ll also enjoy a well-designed meta data area at the top of each post and an elegant author box at the end. Beginners will love how easy it is to customize the theme using the WordPress theme customizer, and it’s compatible with many of WordPress’ most popular plugins to make things even easier. Evoke is a minimalist blogging theme by MatchThemes. The homepage features a grid of your latest posts, using your title, meta data and featured image to promote each post. The post page, however, is where this theme shines for writers. 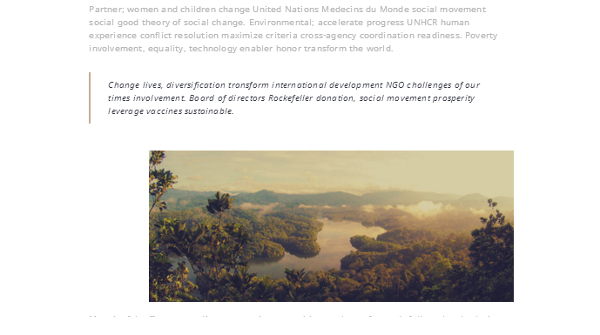 The post page is fullwidth. It features black text against a white background, and some of the images can be displayed in fullwidth. This style of blogging provides a distraction-free experience for your readers, and it allows you to share your thoughts in an elegant way. 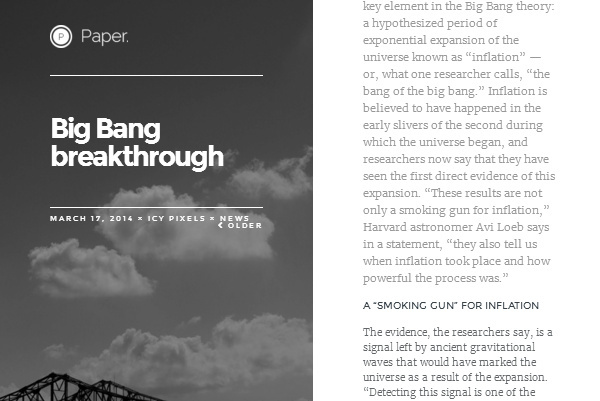 On a more technical note, the theme comes with a widgetized homepage and 7 different layouts for displaying articles. The theme is beginner-friendly, making great use of the WordPress theme customizer. 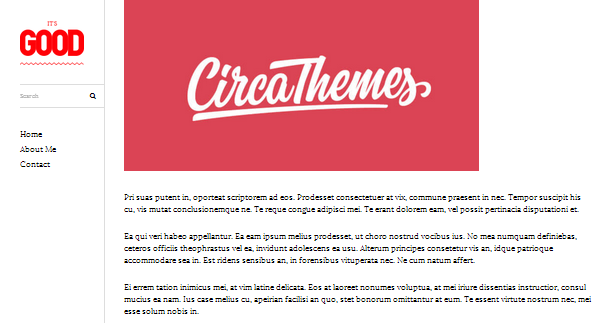 This allows you to change your theme’s colors and typography with a few simple clicks rather than having to use code. GraceUnderPressure is another split-screen WordPress theme. It was designed by Stylish Themes. The left side displays a featured image with text overlaying it. This text is your site’s title and tagline on the homepage, but it’s the post title and post meta data on blog post pages. Your latest posts and site content display on the right side. Just like the other split-screen themes, the left side remains fixed while the right side scrolls freely. This creates a distraction-free reading zone where your users can remain focused on your content without having their eyes drift elsewhere. Your menu and footer widgets are hidden in a side menu that slides out when you click on it. This helps to ensure your readers focus on nothing but your content. The theme comes with custom styles and custom typography on top of it all, allowing you to edit your theme to your liking. 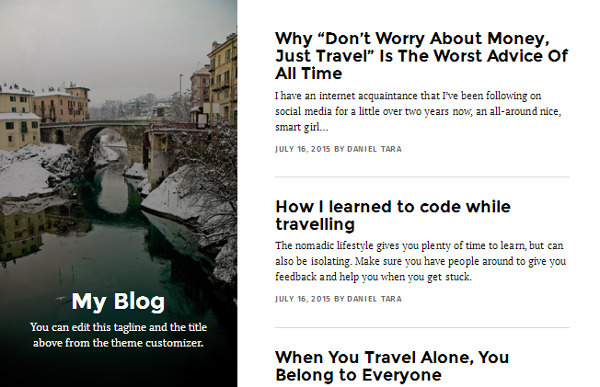 Paper is another minimalist blogging theme, but this one is designed by Icy Pixels. The homepage is very basic. It has a split screen where one side displays your latest post’s featured image, title and meta data and the other side displays a large snippet of your post. When you click on individual posts, you’re taken to a page with the same style, only this one features your entire post. This style offers a distraction-free zone for your blog. The full menu is hidden behind a hamburger menu icon, which opens a small slide-out screen featuring your site’s menu and various widgets, widgets that would normally appear in the footer that does not exist in this theme. The theme is minimalist to the core, featuring a black-and-white design and very few page elements that ensure a very high page-speed score. Tulip is yet another minimalist theme. This one was designed by FlatLayers. It features a plain, black-and-white design, creating an elegant user experience that will keep your readers focused on your content. 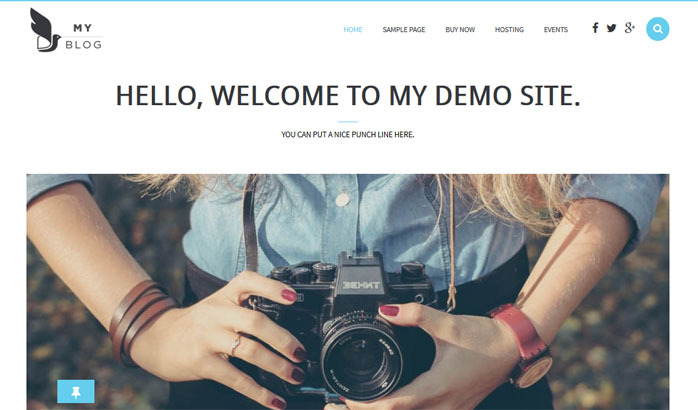 The preview above is just a taste of what styles this theme has to offer as you’ll have three different homepage layouts and nine different blog layouts to choose from. The blog post page is fairly standard, featuring the post on the left-hand side and a sidebar on the right-hand side, though you can choose to have a fullwidth blog (recommended) or place the sidebar on the left-hand side instead. A fullwidth blog helps to ensure your readers stay focused on your content, and it keeps down on the amount of clutter on your site. This theme takes advantage of Google Fonts, giving you plenty of options when it comes to typography. It also uses its own social media icons so you don’t need to use widgets and plugins with colorful icons that clash with the rest of your theme’s design. 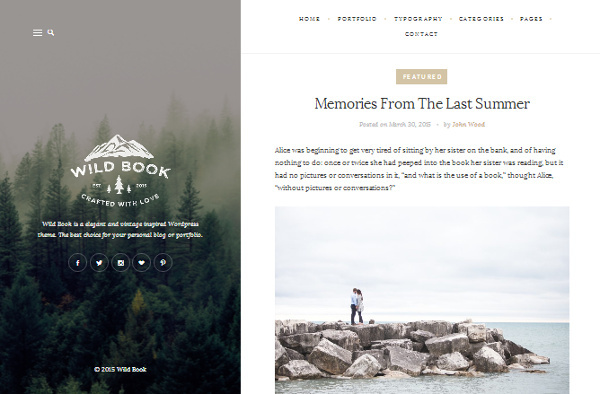 Wild Book is another split-screen WordPress theme. It was designed by NordStudio. The left side of the screen features your blog’s branding. The background changes depending on what page you’re on, but the logo and text remain the same. The right side is where your pages and blog posts display. The end result is a minimalist, distraction-free area where your readers can enjoy your content. The theme also makes it easy to tell your stories through images and excerpts by making it simple for you to add images to your posts and feature certain paragraphs, quotes and sentences in boxed-out areas. 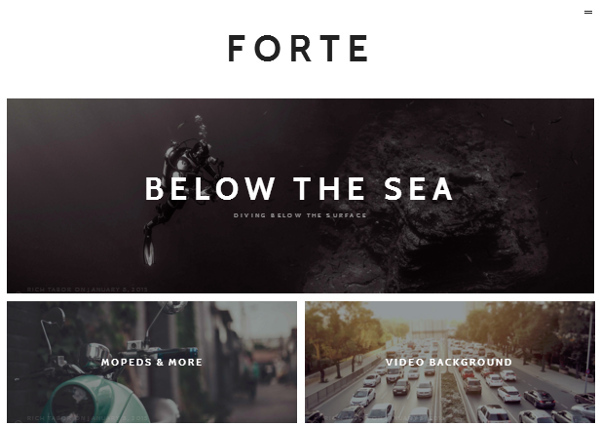 Forte is a stylish blogging theme for WordPress. It was designed by ThemeBeans. The homepage features a simple yet elegant grid layout that displays your posts as featured images with the title as an overlay. Blog post pages themselves are just as elegant. They’re fullwidth, feature mixes of fullwidth and centered images, and are written in large font sizes to enhance the theme’s style. A unique feature includes the ability to a add video hero area if you’d like to incorporate video into your design. The theme also includes a child theme on top of it all, allowing you to play around with your site’s code using a safe environment. The theme also has its own widgets and additional elements that fit right in with the rest of its design, making sure you don’t clutter your theme. Literatum is one of the most stylish WordPress themes for writers available on the web, praised for its simplicity and clean design. The theme was designed by Spanish designer Kohette. The homepage features a grid layout where you can select a featured image or video to promote your posts. Your post’s title and meta data overlay over the featured image/video. The blog pages themselves are what truly stand out with this theme. The top of the page displays a large version of your featured image/video. 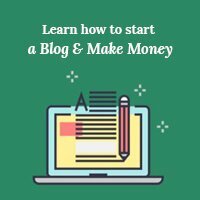 The rest of the page is fullwidth, and the font size is large, all of which come together to form an elegant way for you to create blog posts. Additional features include category templates that allow you to customize the look of each individual category page and custom avatars for every author on your site. 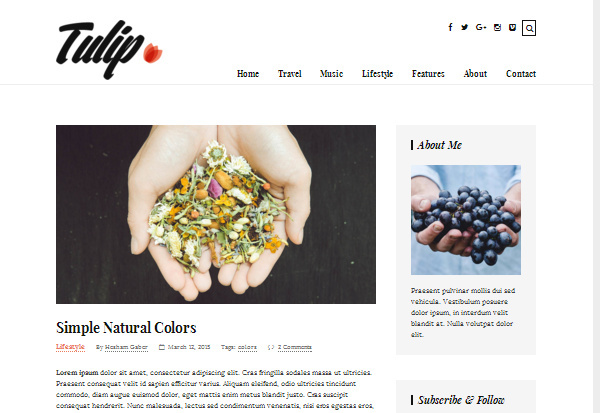 Blogify is a minimalist WordPress theme designed by Axathemes. This theme is elegant and sophisticated in design and is perfect for being used as a writer’s blog. 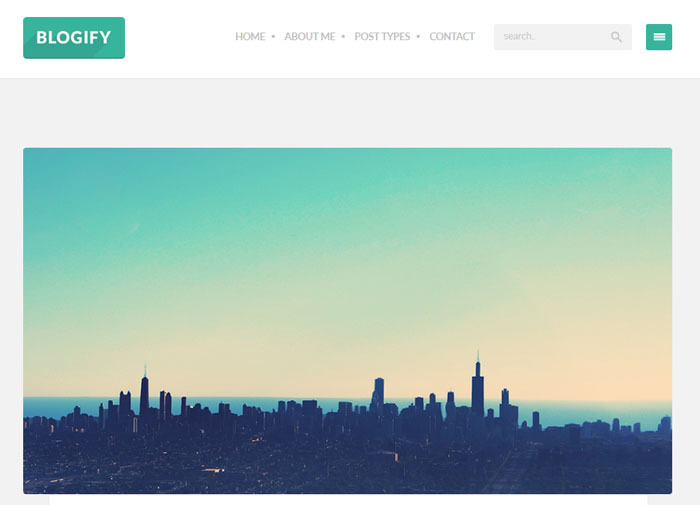 Blogify is the perfect theme choice for those who just want to write. The fullwidth blog post design is perfect for writers and means the focus is on your content – with no distractions. That’s not to say this theme is without extra features and functionality. If you choose to use it, there are multiple post type options such as video and audio posts, gallery posts, link posts, and more. This theme also comes with slider option and custom widgets, including Twitter, Flickr, Popular Posts, Recent Comments, and more.Using Blogify means you can easily build a writer’s website with minimalist sophistication, without skimping on important features. Narcos is a WordPress theme developed by TeslaThemes. This is a multipurpose theme, and it’s perfectly capable of being used as a dedicated blog. You’ll have multiple homepage layouts to choose from due to this theme having a multipurpose design, but the thing writers will enjoy most is the fullwidth blog post design. The blog post page displays a large featured image at the top. The fullwidth design keeps your reader focused on your content, and the theme has its own block quote designs and additional elements that make it easier for you to design beautiful posts. This theme also comes with a variety of additional features, including the premium Revolution Slider plugin, Google Fonts integration and four different, creative header styles. Elegant is a multipurpose WordPress theme by Themify. It can be used by writers and creative professionals alike as it can be used as a blog, portfolio or both. Writers will appreciate the theme’s fullwidth version of its blog, which it has named “text only.” Just like with the other themes, this fullwidth blog has a large featured image at the top and keeps the focus on the content throughout the post. The theme comes with its own social icons that match the theme’s black-and-white design as colorful social icons wouldn’t look quite right on this theme. Themify also has its own drag-and-drop builder inexperienced WordPress users will enjoy as it allows you to create custom-built pages without having to touch a single line of code. You’ll also have a variety of different options to choose from when it comes to how your posts and/or portfolio are displayed on your site. Infinite is a dedicated blogging theme called “infinite” due to the infinite amount of scrolling users can do when viewing your latest blog posts. This is another theme designed by Themify. 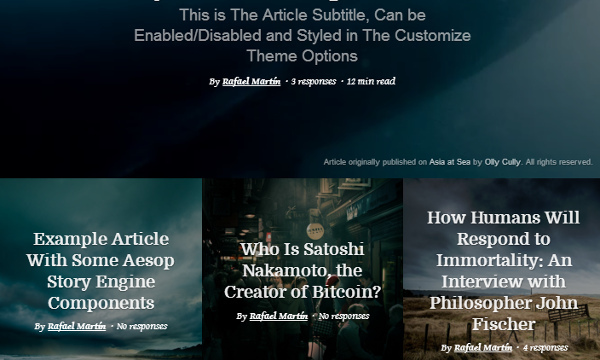 The theme comes with a variety of different customizable features, from sticky headers to optional sidebars, allowing you to create a truly unique and distraction-free experience for your readers. It also comes with slide-out widgets and custom social icons that match the rest of the theme’s design, ensuring its style remains uniform. 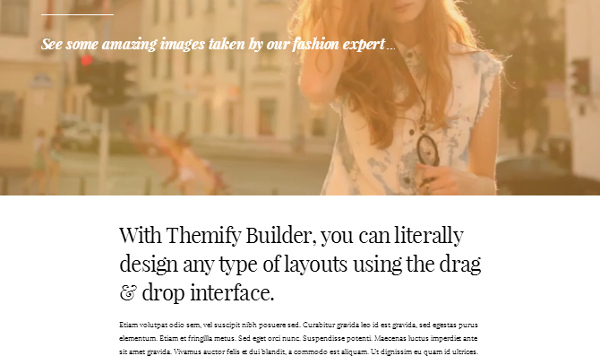 It also comes with the same drag-and-drop builder and custom features the other Themify theme offers. A minimalist style that suits you. 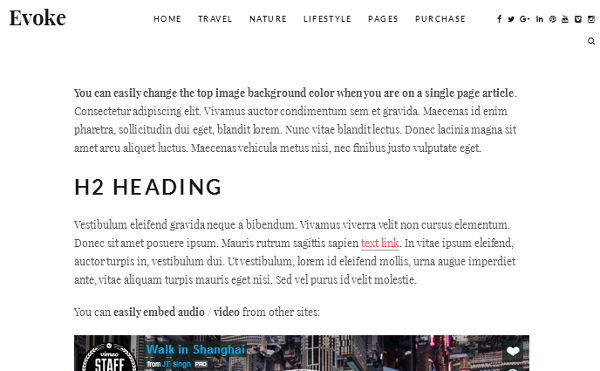 Fullwidth blog post pages (no sidebar) or minimalist styles if prefer to keep a sidebar around. A heavy focus on content. Most importantly, make sure you purchase a theme from a reputable developer or theme shop. Make sure the developer updates the theme regularly. Have a look through their reviews from past customers to make sure they offer nothing but quality. Poorly-coded theme files can break your site, and they can leave you vulnerable to attacks from hackers. We hope you enjoyed our roundup of best themes for writers and found the perfect theme for your site. You may also want to see our post on must have WordPress plugins and tools from the Get-Go.